It’s kind of hard to believe, but 2016 marks the 4th anniversary since Friends was launched (I was convinced it was only 3 years), and I think a number of the sets in the newly released wave contain very clear echoes of those first sets launched in 2012. One such set is 41115 Emma’s Creative Workshop, which harks back to Emma’s love of fashion that was first shown in 3936 Emma’s Fashion Design Studio. But is this set a rehash (the bane of fans of City and Star Wars), a sign of the Friends designers running out of ideas, or a good follow-up to a previously established character trait? Let’s take a look. 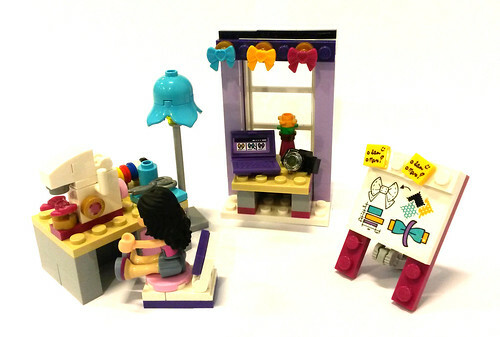 © 2016 Brickset.com. Republication prohibited without prior permission.